In his book Foucault's Pendulum (1990), Umberto Eco wrote: "The Pendulum told me that, as everything moved — earth, solar system, nebulae and black holes, all the children of the great cosmic expansion — one single point stood still: a pivot, bolt, or hook around which the universe could move. And I was now taking part in that supreme experience. I, too, moved with the all, but I could see the One, the Rock, the Guarantee, the luminous mist that is not body, that has no shape, weight, quantity, or quality, that does not see or hear, that cannot be sensed, that is in no place, in no time, and is not soul, intelligence, imagination, opinion, number, order, or measure. Neither darkness nor light, neither error nor truth." 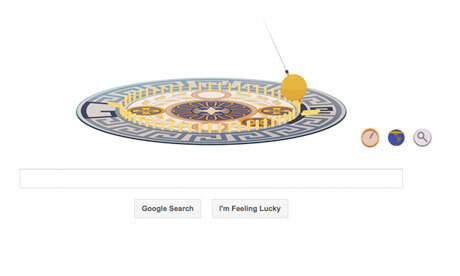 See the complete collection of Google Doodles here.